When you start a diet, you’ve got all the best intentions for sticking with it and reaching your weight loss goal. Unfortunately, many (even most) people who start a diet give up after a few short weeks, or even less. Why does this happen? Even though you may WANT to change, you may also have a hard time doing it. Let’s face it; most of us are creatures of habit. We like things comfortable and predictable. If we’re forced to change our comfortable habits (or if we simply decide we want to change them), we suddenly don’t like the instability and unpredictability that consumes us. There are two possible solutions: either find a way to make your new habits more comfortable, or keep telling yourself that change is good, even if it feels strange at first. Over time, your new habits will naturally become more comfortable for you. The trick is to hang in there long enough until you get used to living a healthier lifestyle. Once that happens, it becomes a new habit, and maintaining it is relatively effortless. What can you do if you just don’t feel motivated to exercise, eat right, and take better care of yourself? GET motivated! There are so many ways to improve your mood, boost your energy, and make dieting more appealing. Experiment with new recipes. Look at photos of slender models and imagine how good it’s going to feel to be like that yourself. Join a walking club. Make your healthy new lifestyle fun and exciting and you’ll have no shortage of motivation. 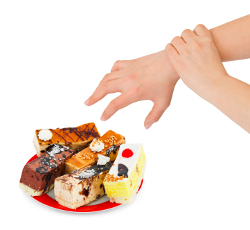 If you have fallen under the spell of “eat all you want and still lose weight” that is hyped by many diet pills and programs today, you may be trying to “have your cake and eat it too”. You simply can’t keep eating all of the foods that made you fat, and lose weight at the same time. Occasional treats are fine, but do it every day, or even every week and you could be in trouble. Instead, find ways to remake your old favorites in healthier, lower calorie ways. Or create some new diet-friendly treats that you enjoy just as much. Save fattening treats for special occasions, and even then have just a few bites to satisfy your taste buds. Are you SURE you really want to lose weight? When you consider all of the challenges and discomfort that might come along with it, you may be sabotaging your own goals so you don’t have to deal with all of that. For example, you might get a lot of attention if you lose weight, and if you are a shy person you might resist losing weight because of that. If you lost weight, you would no longer have any excuses for not living the life you dream of, so you stay overweight. There are endless things you could fear, but they all come down to one thing: perception. Remind yourself that even if you have to deal with some uncomfortable circumstances after you lose weight, you can still handle them. Also remind yourself that you deal with plenty of discomfort just being overweight! You can’t deal with the cravings. No matter what your personal diet challenges are, solutions exist! Simply be proactive in finding the solutions that work best for you. Fatigue and Weight Loss: Are You Overdoing It?